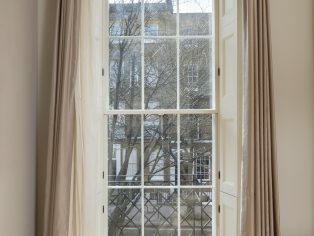 2017 An historic Listed Georgian townhouse in London’s Bloomsbury has been transformed into a comfortable, peaceful and energy efficient home that approaches Passivhaus EnerPHit standards. Robert Prewett of Prewett Bizley architects took on the challenge of convincing conservation officers that a Grade II Listed building could be successfully fitted with a host of energy saving measures whilst respecting all the historic features. The large single glazed sash windows were a particular challenge as they represented a significant proportion of the wall area and could not be replaced. Therefore the answer was secondary glazing; but the extremely high levels of insulation required, the aesthetics and the need for working shutters in some rooms demanded a bespoke solution. Robert approached Selectaglaze which was both developing a new sash window design and trialling Pilkington’s Spacia thin vacuum units which have a centre pane U-value of 1.0. 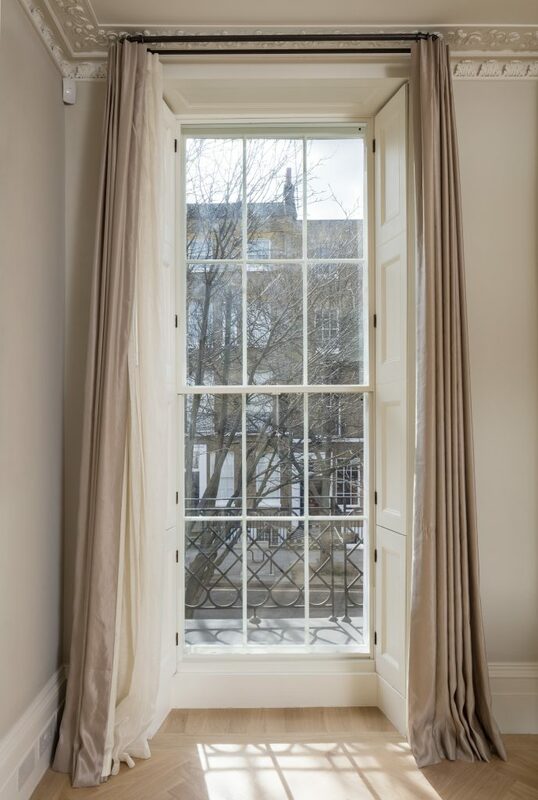 The resulting Series 25 window proved perfect for the project as it offered high sealing efficiency, a very low U-value and a discrete frame with a specially developed slide catch that allowed shutters to fully close. The house now has air tightness close to 1 air change per hour at test pressure which demonstrates that the secondary glazing is performing very well. The complexity of the project and the time needed to obtain consents meant that part of the building had to be occupied before the secondary glazing was fitted. As a result, the owner experienced the change in comfort levels offered by the original window and with the secondary glazing in place. The difference was remarkable and what was also evident was the almost complete removal of road noise. This had not originally been regarded as a significant problem but the absence of noise certainly added to the comfort. Monitoring tests will now assess the efficiency of the scheme over time but meanwhile there has been a transformation that provides a modern comfortable home environment within an historic building. To find out more about Selectaglaze’s high performance thermal or acoustic secondary glazing, you can visit them at EcoBuild: stand C174.